About 610,000 people die of heart disease in the United States every year–that’s 1 in every 4 deaths. Cardio vascular diseases such as coronary artery disease, arrhythmias, heart valve disease, heart attack, congenital heart disease, heart muscle disease, aorta disease, vascular disease, & pericardidal disease are the leading cause of death in the United States. On August 10th 2015 this statistic nearly became personal. Bub Cronin, CEO of NBA Research Group entered the E.R. with a breathing problem. After xrays the doctor said “You have A-FIB and congestive heart failure.” The labored breathing and periodical left arm pain had been going on for 6 months. Bub passed this off as anxiety. His condition was so severe that they shocked his heart and the doctors were considering surgery. His heart was only functioning at 20%. After leaving the hospital a week later he had to take medication and wear a life vest with a heart monitor. The doctor said that after 3 months, if his heart muscle was up to 35 percent they would not have to operate. That was just the news he needed. Bub went to work researching and developing an all natural blend that would help his condition. 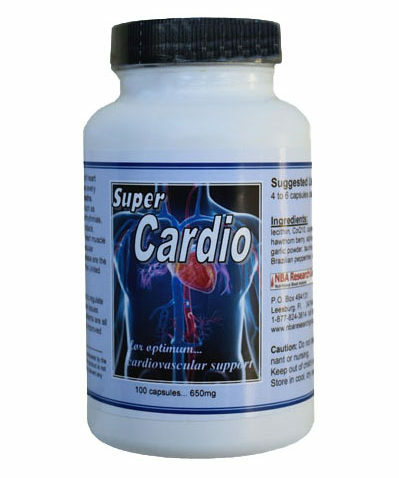 The end result was Super Cardio, a combination of 10 ingredients that have a track record of cardio vascular support. Along with the meds he took a hefty dose of Super Cardio daily. His 3 month check up simply amazed all of the medical staff that were familiar with Bub’s condition. The echo cardiogram was at 65%. They said they never seen such a strong recovery, even with the medications. The doctor said that he had the heart of a 35 year old. No operation necessary…and a new product was born. Lecithin...As a tool for heart health, lecithin also works to address damages that may arise from coronary artery disease. Discouraging cholesterol and other fats from sticking is a vital function for the overall health of anyone with a predisposition to heart disease and other cardiovascular afflictions. The lubrication provided by lecithin creates a slippery lining on which it is difficult for large, fatty deposits to adhere. When large deposits of fat cannot adhere to specific regions of the body, they are transported to the liver where they are metabolized and converted to energy. Improved circulation is seen as a result of lecithin supplementation. CoQ10… In addition to being a potent antioxidant, CoQ10 helps maintain healthy blood pressure and cholesterol levels, promotes arterial health and supports a strong heartbeat. Cayenne Pepper…Cayenne helps to keep blood pressure levels normalized. It also balances the body of LDL cholesterol and triglycerides. Cayenne pepper also helps with atherosclerosis, encourages fibrinolytic activity and discourages formation of blood clots, all of which can support factors that discourage a heart attack or stroke. Hawthorn Berry… The berries have been used in traditional medicine since the first century, and contain phytonutrients called anthocyanidins and proanthocyanidins, antioxidants that have a variety of therapeutic effects including strengthening the walls of blood vessels. Extracts of hawthorn berries, leaves and blossoms also contain compounds that have a tonifying effect on the heart and vascular system. Alpha Lipoic Acid... has benefits for all types of people and particularly those with diabetes or higher than normal blood sugar levels, high cholesterol levels, some vision conditions, (i.e.. macular degeneration) cardiovascular problems such as hardening of the arteries and other conditions associated with the aging process. Garlic Powder…improves blood circulation, encourages normal blood pressure, fights against arterial plaque…plus many other health benefits. Taurine… promotes cardiovascular health, insulin sensitivity, electrolyte balance, hearing function, and immune modulation. In animal research, taurine protected against heart failure, reducing mortality by nearly 80%. L-Carnitine… is another key nutrient for cardiovascular health. It helps chaperone EFAs into the mitochondria, where they are turned into energy. L-Carnitine works with CoQ10 to help ensure your heart has the energy it needs to keep pumping. Brazilian Peppertree...as a support for hypertension and for irregular heartbeat. Vitamin E…is a powerful antioxidant. Vitamin E is necessary for structural and functional maintenance of skeletal, cardiac, and smooth muscle. It also assists in the formation of red blood cells and helps to maintain stores of vitamins A and K, iron, and selenium.